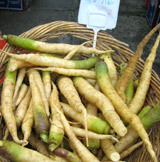 Wild carrots originated about 5,000 years ago in what is now Afghanistan. Both Egyptians and Greeks used the wild green, purple, white, yellow and black-rooted plants medicinally. Although originally cultivated in the pre-Christian era, carrots weren’t a significant crop until the 10th century when purple varieties were grown in India, Europe and the Middle East. Germany and France cultivated a diverse palette of the enlarged taproots in the 13th century, and by the 15th century, they had made their way to both southern Europe and England. But the history of the orange vegetables that are so familiar to us today began in 16th century Holland during the rule of The House of Orange. No, it’s not a coincidence. Dutch farmers developed orange carrots (a cross of purple and yellow varieties) in an act of patriotism. After this development, Holland became the premier carrot-breeding country. Using both Dutch varieties and the modern wild carrot (Queen Anne’s Lace), the contemporary carrot was developed by a French horticulturist in the 1800s. If this history lesson isn’t motivation enough, let’s talk about taste. In the fall and winter root vegetables are at their absolute sweetest because cold air and soil temperatures encourage the conversion of starches to sugars. Crops harvested from cooler regions of the state are mostly “clip-tops” because their delicate above-ground parts have frozen off, while carrots grown in more temperate coastal regions might still be connected to their stems and leaves. The culinary directions that you can take these lovely roots are as many as their shades – soup, salad, cake, bread, juice, braises, stews, and more.